New York State is in the northeastern part of the United States of America. It is best known for New York city with its Manhatton sky scrappers but the state itself is covered in forests, rivers and mountains. 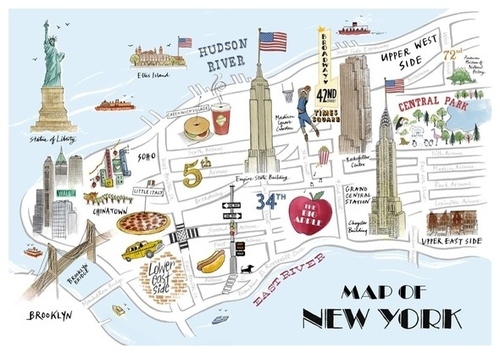 New York is ranked as the 27th largest state and is probably one of the most famous places in the USA. I was in New York a few years back and vivedly remember the contrast in surroundings, the city was full with amazing archetecture and massive crowds whereas just beyond the city lines was a lot more peaceful and quiet nature. The image above is a very famous site crossing over the Brooklyn Bridge. Broadway is definitely my favourit part of New York, I remember walking down the street and being amazed at the lights and posters with so many theatre goers. Looking up the street you see bright lights and hear music all around, the area is almost always buzzing and the 40 + professional theatres are kept to the highest standards. Broadway shows sold around $1.081 billion worth of tickets in 2011 with an attendance of 12.13 million.